This is the first installment in a new series: books about feelings. Over the years I’ve often turned to books to help my kids understand their big emotions. Since helping our children overcome their fears can be a big challenge for a lot of parents, I thought I’d start with a list of picture books about fear and courage. Sheila Rae the Brave is a must-read classic picture book about being brave. Sheila Rae is very brave when it comes to thunder, dogs and stepping on cracks. She thinks her little sister, Louise is a scaredy-cat. But Sheila Rae has to face fears she didn’t know she had when she gets lost and it is up to Louise to save the day. Daredevil Duck. My 7 year old loved this book about a duck who dreams of being brave. Despite his name, Daredevil Duck happens to be afraid of everything. Everything. But one day Mole requests Duck’s help retrieving a balloon. Daredevil Duck overcomes his fears to help, and in doing so makes a new friend. I love how duck needed to be brave in order to help someone else, instead of proving his bravery for a self-serving reason. Fun and charming. Brave Irene. Irene’s mother is a dressmaker and is unable to deliver an important gown to the duchess. In typical Steig style, Irene braves the winter storm, facing her foes, the whipping wind and swirling snow to get the gown to the grateful lady in time. The Fun Book of Scary Stuff is by Emily Jenkins, one of my favorite, must-read children’s authors. A boy shares his fears with a dog, who debunks them one by one in a most amusing way! If your child fears the dark or other mysterious creatures, have a good laugh over them. The Dark. When I heard there was a collaboration between Lemony Snicket and Jon Klassen being released I thought, “If that book is not good, I will just give up.” Fortunately it is great! Laszlo is afraid of the dark. It usually lives in the basement, although it also lurks in closets and behind the shower curtain. Every morning Laszlo says hello to the dark, hoping that the dark would stop visiting his bedroom at night. One night the dark speaks to Laszlo and leads him to the cure for his fear. Much has been said about this book and its meticulous writing, and I can not hope to compete with the prose of real critics. In the end, all that you need to know is that it’s a book my then-4 year old, who is afraid of the dark, requested again and again. It didn’t miraculously cure him of his fears, but it’s a good book, nevertheless. Flight School by Lita Judge. A young penguin may not have exactly the right body for flight, but he has the “soul of an eagle.” Eager to enroll in flight school and learn what it takes to soar, he is not discouraged. Fortunately, the other birds are so taken with his determination they do what it takes to make his dreams come true. Utterly delightful. Scaredy Squirrel is a well loved series and has become one of the classic picture books about fear. Scaredy’s hyperbolic fear and intense need to be prepared for every situation will make kids giggle and guffaw. But they will also cheer for Scaredy when he finally leaves the security of his nut tree. Nana in the City is by Lauren Castillo, one of my favorite author/illustrators. The big city can seem very scary when you are a small person and not used to the noise and the crowds. We should all be so lucky to have a grandma who gives us a special cape that helps us to be brave in the face of new experiences. Wonderful. Thunder Cake. Patricia Polacco is one of those authors who seems to have a book for every situation. I really enjoyed her take on the classic “I’m scared of thunder” book. This story is based on her own experience (as many of her books are) of how, when she was a girl, her grandmother helped her overcome her fear of thunder. When a storm is on the horizon, the grandmother insists that they must get the traditional “thunder cake” in the oven before the storm arrives. However, some of the ingredients are not so easy to collect. They make the cake in the end, of course, and the storm rages outside while the calm settles inside. Courage by Bernard Waber. This is a sweet and gentle book that is often recommended when parents are looking for books about overcoming fears. It explores what it means to have courage and all the different kinds of bravery there are. The story emphasizes how courage most often exists in the every day moments, like learning to ride a bike, or “being the first to make up after an argument.” Parents will easily be able to reflect and chat with their kids on how kids were brave during the day. Mirette on the High Wire. Mirette helps out with the chores at her mother’s boardinghouse, and becomes taken with one of the guests who has a peculiar talent. Mirette persuades The Great Bellini to teach her his high-wire tricks, but it is the younger funambulist who teaches him to overcome his fears. McCully’s Caldecott winning illustrations may remind you a bit of Toulouse-Lautrec’s paintings. The Doghouse. This hilarious picture book is great for preschoolers on up and is a winning pick for story time. Mouse, Pig, Cow, and Duck are happily playing when their ball accidentally rolls into the doghouse! Who will be brave enough to get the ball? Mouse “bravely” volunteers each of the other animals in turn, but they all cower in fear as the dog explains he’s having each of the animals over “for dinner.” But what that really means will have your child grinning from ear to ear. Miss Hazeltine’s Home for Shy and Fearful Cats is relatively new to the shelves and my son requested repeated readings of it. Miss Hazeltine has taken it upon herself to run a school for shy and fearful cats. Her mission is to teach them how to be brave in the face of birds and brooms alike. Crumb is the littlest and most fearful of all. However, one day, when Miss Hazeltine goes out for some milk and never returns, Crumb channels his inner bravery and leads the rescue mission. When Lions Roar. The text in this book is simple, but the story is meaningful. A young child is overwhelmed by frightening sensory experiences: roaring lions, cracking thunder and more. He sits down and tells them, “go away!” and when he opens his eyes he sees calm and beautiful images: mommies and daddies, flowers. Raschka’s illustrations are perfect for the story and there’s a nice message in this book about how we can turn scary situations around with a change of perspective and positive thinking. Max the Brave. We loved this funny book! Max is a fierce kitten. Unfortunately not everyone knows this and they dress him up in pink bows! What are they thinking? Max, however, is on a mission. He will catch a mouse and then everyone will know how brave he is! Just one teeny problem. He doesn’t know what a mouse looks like. My kids were giggling non stop. There’s a Nightmare in my Closet is a sweet, sweet classic by Mercer Mayer. One night a boy decides to conquer his fear of monsters by donning a soldier’s helmet and arming himself with a cork gun. When he turns out the lights, the monster returns. The boy pops him with his gun and the monster bursts into tears. The boy bravely consoles the creature and they drift off to slumberland together. There Are No Scary Wolves. A little boy wants to go outside but his mom is not yet ready and tells him to wait. His imagination takes him outside to explore the neighborhood but his overactive imagination sees wolves everywhere and he decides it might be better to wait for his mom after all. The story has a gentle humor to it and kids will like spotting a little surprise in the end paper illustrations. The Story Of Ruby Bridges. I really like this book because it’s the true story of a child told in a way that children of the same age can really understand. This book celebrates six year old Ruby, who in 1960, faced angry crowds and empty classrooms as she became the first child to attend an all-white school after a court-ordered desegregation in New Orleans. Author Coles does a great job of making an historical event personal and showing how a child can overcome a difficult situation. 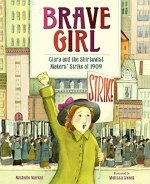 Brave Girl: Clara and the Shirtwaist Makers’ Strike of 1909 by Michelle Markel, illustrated by Melissa Sweet. Clara comes to NYC dirt poor but full of grit. She works a miserable, backbreaking job at a garment factory. An extraordinary individual, she taught herself to read and led the largest walkout of women workers in U.S. History, despite being beaten and jailed for participating in labor strikes. Melissa Sweet’s books and illustrations just keep getting better and better and she tells a valuable story of the history of women workers, the importance of fair labor practices, and being brave in the face of powerful institutions, all of which still resonates today. Oliver Button Is a Sissy. I was rather surprised to find this 1979 dePaola book. Oliver Button likes to do things like play with paper dolls, dress up, draw and read. The other boys tease him and write “Oliver Button is a Sissy” on the school walls but his parents sign him up for dancing lessons, where he thrives and works hard on a routine for the talent contest. Oliver doesn’t win the contest, but when he returns to school he finds the boys have crossed out “sissy” and written “star”. At first I was put off by the way Oliver’s father also rejected Oliver’s differences, but his father not only let him start dance class, he ended up being proud of Oliver. I thought about how a lot of parents, unfortunately, still lack the courage to accept their children when they don’t conform to an ideal picture. I also liked the fact that Oliver’s difference was not what got him down, it was the results of the talent contest. Let’s face it, we all are a little bummed when we don’t win, but the new found support of his friends was just the right ending. Ruby’s Wish. In old China, Ruby lives with her enormous family. Boys are considered lucky and girls are expected to embroider and get married. Ruby is dissatisfied with her family’s emphasis on traditional gender roles. Ruby doesn’t want to get married, she wants to go to university like her brothers. Ruby bravely tells her grandfather her wish, but doesn’t expect things to change for her. Just before she thinks she will have to get married, however, she finds her wish has been granted. This is a great book to start a conversation, not only about how society’s expectations for girls has changed (or not changed) over time, but also about the importance of speaking up for what you want. My Name Is Bilal. The current political climate demonstrates that children who are different from the mainstream have every reason to worry about being bullied for being Muslim. We must teach our kids that it is not okay to single out a specific ethnic or religious minority for ridicule and we must bravely stand up to those who do! After someone pulls off his sister’s headscarf, Bilal worries that maybe he should hide the fact that he his Muslim from his classmates. His compassionate teacher gives him a book about a brave Muslim named Bilal and Bilal decides to stand up for his sister, earning the respect of his peers. Henry’s Freedom Box. Talk about being brave! This is the true story of Henry Brown, a slave who, when separated from his family was determined to reach freedom. Using his limited resources in an environment of great adversity and danger, and with the help of an abolitionist, he packs himself inside a crate and mails himself to freedom. Amandina is one of my all time favorite books. Amandina is very talented, but very shy. To overcome her shyness she decides to put on a show. She cleans up an old theater, constructs the sets, sews the costumes, rehearses the acrobatics and puts up the posters. When she opens the curtains, however, the house (aka the audience) is empty. Disheartened, but determined, she puts on the performance of a lifetime, not knowing that while she sings and dances the audience is growing… Ruzzier’s illustrations evoke the commedia dell’arte of his native Italy and his text perfectly captures the true spirit and heart of what it means to be a performer. A must read, and get it while you can, because it’s gone out of print. The Adventures Of Sparrowboy. One day while riding his bike Henry collides with a bird and becomes Sparrowboy! He uses his new found powers to save the neighborhood from bullies and runaway wagons – all while completing his newspaper route. Great fun. We had just finished reading Thumbelina when I picked up The Smallest Samurai to read to my then-5 year old so he latched right on to this story about a tiny and brave little warrior who makes a sword out of a needle and wears armor made from beetle wings. Inchkin, as he is called, manages to vanquish two demons and as a reward wins two prizes: height and the princess’ hand. Sergio Makes a Splash. Both my sons giggled at the idea that a penguin could love water but still be afraid of swimming. His swim teacher, Mrs. Waddle gives him some gentle encouragement and Sergio finally takes the plunge (so to speak). Even though my almost 5 and almost 9 year olds (never too old for picture books!) enjoyed this I also think its straightforward plot and gentle humor make it a great choice for preschoolers. The Pink Refrigerator is also on my lists of books about trying new things. Sometimes just getting out is enough to make a big difference in one’s life. The badger (? mole? – I’m not really sure what kind of creature he is!) finds a mysterious pink refrigerator in a junk yard. Each day the note on the fridge sports a new suggestion, like “read more”, “make pictures”, or “play music”. Inside the fridge he finds the materials he needs: books, art supplies, a trumpet, etc. The final note, “keep exploring” prompts Dodsworth to leave his own note, “Went to find an ocean.” This is a great story about the willingness to be brave and open to trying new things. 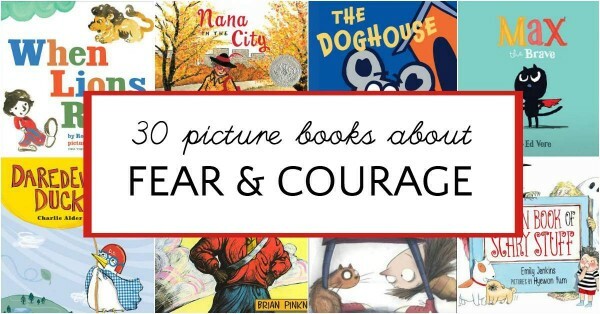 What are your favorite picture books about fear and courage? Don’t miss any more lists in our series of picture books about feelings. Subscribe to our newsletter. Your newsletter is eagerly awaited in my home. I’m a doting Grandma who feels in touch with my 3 & 4 year old grandkids because I have your newsletter to keep me up to date and in touch with their world. Thank you so much. Wonderful! Thank you for your kind words. I have been trying to find a picture book around in the sixties about taking a walk and discovering pattern and colour in everyday things it includes an illustration of a snail shell depicted in colour. Please help if you can. Thank you. Wow! Great resource. I’m a mother of 3, a teacher (3rd grade) and an avid reader…and you managed to have multiple titles on this list that I have never read (as well as several I have read and enjoyed.) Thanks for the great list. I like Pete and Pickles by Berkeley Breathed as a story of friendship and courage. I’m excited to check out several of these titles. Do you know of any books on school fears in children?